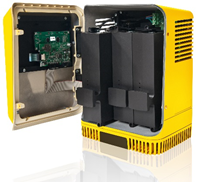 LIFETECH MOD1™ – Mountain Power, Inc.
Go modular with HAWKER®’s latest innovation of high-frequency, smart chargers. The LIFETECH™ MOD1 and LIFETECH™ MOD1C chargers provide optimum charging, peak efficiency, and non-stop power to meet the growing demands of the worldwide material handling equipment market. Every module in the HAWKER® LIFETECH™ MOD1 and LIFETECH™ MOD1C chargers are stand-alone, eliminating the risk of catastrophic failures and downtime. 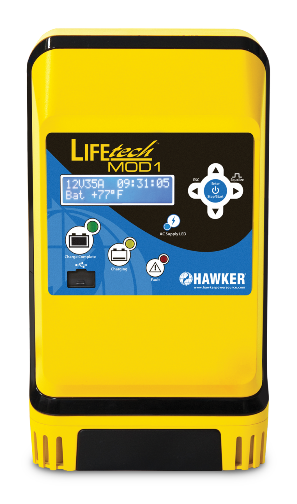 Get reliable, proven power with the new high- frequency modular HAWKER® LIFETECH™ MOD1 and LIFETECH™ MOD1C chargers. Our most compact chargers to date, the HAWKER® LIFETECH™ MOD1 and LIFETECH™ MOD1C chargers offer maximum reliability and improved efficiency to keep you moving. Offering one, three, or six* unique, individualized power bays, the HAWKER® LIFETECH™ MOD1 and LIFETECH™ MOD1C chargers provide you with a non-stop charge. Even if one module stops working, the rest will keep working to continue charging the battery – making downtime a thing of the past. The self-diagnostics feature on the LIFETECH™ MOD1 and LIFETECH™ MOD1C chargers alerts operators to any possible failures. Replacement modules are available for quick delivery, and because of their plug-and-play design, installation is fast and simple. Our modular charger design offers the built-in advantage of scalability. The 3-bay and 6-bay* LIFETECH™ MOD1 and LIFETECH™ MOD1C charger cabinets allow modules to be added or removed in response to changing power needs. Your current operations may require only a few modules to effectively charge your batteries. But as your workload increases (or if you switch to opportunity charging), these larger cabinets can quickly accommodate additional modules to meet your expanded power requirements. The scalable nature of these modular chargers meets your needs today – and tomorrow. The HAWKER® LIFETECH™ MOD1 and LIFETECH™ MOD1C chargers are designed to meet the rising standards for solutions in material handling equipment, automated guided vehicle systems, cleaning machines, and industrial electric vehicles.